Extraction of DNA, RNA and proteins is a common procedure involving in molecular approaches for the studies of genome, transcriptome and proteome of biological samples. Although designed for the extraction of DNA, RNA and proteins, TRIzol is utilized most frequently for the extraction of nucleic acids, while RIPA is the most widely used agent for protein extraction. Simultaneous extraction of DNA, RNA, and proteins is sample-saving, and coordinated analysis of an individual sample is crucial for accurate correlations between genomic aberrations and their consequences on the transcriptome and proteome. Thus, we provide a detailed protocol describing extraction of total protein following TRIzol isolation of nucleic acids. PBS: To prepare 1 L 1X PBS: dissolve 8 g of NaCl, 0.2 g of KCl, 1.44 g of Na2HPO4, 0.24 g of KH2PO4 in 800 mL distilled H2O, then adjust pH to 7.4 with HCl and adjust volume to 1 L with additional distilled H2O. 0.3 M guanidine hydrochloride solution: To prepare 100 mL: dissolve 2.87 g guanidine hydrochloride in 80 mL 95% ethanol, and adjust volume to 100 mL with additional 95% ethanol. 1% SDS solution: To prepare 100 mL: dissolve 1 g SDS in 100 mL distilled H2O. 1. For cultured cells: wash the cells with cold PBS, add 1 mL TRIzol for 1~5 x 107 cells, and then remove into a 1.5 mL EP tube on ice. 2. For tissue samples: weigh the sample, add 1 mL TRIzol for 50~100 mg tissue, homogenize on ice with a mechanical homogenmeter, and incubate on ice for 5 min. Note: Be cautious when using an ultrasound homogenizer, as it may cause strand breakage of nucleic acids. 3. Centrifuge at 12,000 rpm at 4 °C for 5 min, collect the supernatant into a fresh 1.5 mL EP tube. 4. Add 200 mL chloroform and mix thoroughly, and then incubate on ice for 5 min. 5. Centrifuge at 12,000 rpm at 4 °C for 15 min. 6. 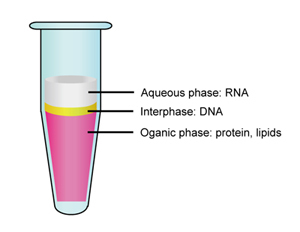 Remove aqueous phase for RNA extraction. 7. Precipitate DNA by adding 300 mL (for 1 mL TRIzol) ethanol. Mix thoroughly and incubate for 3 min at room temperature. 8. Centrifuge at 2,000 g at 4 °C for 5 min, collect the supernatant into a fresh 2.0 mL EP tube. 9. Precipitate proteins by adding 1.5 mL isopropanol (for 1 mL TRIzol). Mix thoroughly and incubate for 10 min at room temperature. 10. Centrifuge at 12,000 g at 4 °C for 10 min, discard the supernatant. 11. Add 2 mL 0.3 M guanidine hydrochloride solution, and incubate for 20 min at room temperature. 12. Centrifuge at 12,000 g at 4 °C for 5 min, discard the supernatant. 13. Repeat Step 11 and 12. 14. Wash the protein pellet with 2 mL ethanol as the same procedure described in Step 11 to 12. 15. Vacuum dry the protein pellet for 5~10 min. Note: Avoid for long-time drying, as it may cause difficulties in resolubilizing the protein fraction. 16. Add 1 mL 1% SDS solution for 50~100 mg tissue, dissolve the protein by repeated pipetting. Note: Incubate at 50 °C after pipetting is helpful for protein dissolving. 17. Centrifuge at 10,000 g at 4 °C for 10 min, collect the supernatant into a fresh 1.5 mL tube. 18. Analysis the protein by western bloting. 1. Amanda B. Hummon, et al., Isolation and solubilization of proteins after TRIzol® extraction of RNA and DNA from patient material following prolonged storage, Biotechniques. 2007 Apr; 42(4): 467–472.